Observation — Some discolored spots on your teeth may indicate decay, but not all of them. Your dentist may use an explorer, a metal instrument with a sharp tip, to probe for possible decay. Healthy tooth enamel is hard and will resist pressure by the explorer. Decayed enamel is softer. The instrument will stick in it slightly. Cavity-detecting dye — This can be rinsed over your tooth. It will color the decayed areas and rinse away from healthy ones. X-rays — X-rays can help your dentist see decay that doesn’t show on the surface. However, X-rays are often not accurate in detecting smaller cavities on occlusal (top) surfaces. Current fillings or other restorations also may block the view of decay. 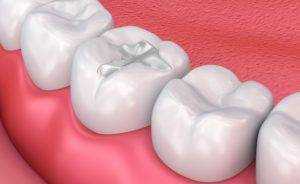 They also help in detecting caries that are present below fillings. Laser fluorescence cavity detection aids — This measures changes caused by caries (tooth decay). They are especially useful for pit and fissure areas. When you visit your dentist to get a filling, you may be given local anesthesia to numb the area if necessary after which your dentist will remove decay from the tooth, using hand instruments or a drill. Air abrasion and lasers also can be used to remove decay. At first, your dentist will use a high speed drill (the one with the familiar whining sound) to remove the decay and unsupported enamel of the tooth. Once the drill reaches the dentin, or second layer of the tooth, the dentist may use a lower speed drill. That’s because dentin is softer than enamel. Some people feel sensitivity after they receive a filling due to pressure, air, sweet foods or cold. Composite fillings often cause sensitivity. The first type occurs when you bite, and worsens over time. This is caused by a filling that is too high and interferes with your bite. Once your anesthetic wears off, you would notice this right away. Contact your dentist. You will need to return to the office to have the filling reshaped.